Invite comment on May 5th’s Alternative Vote referendum and you’re guaranteed to empty a pub, send guests home early at a dinner party, and probably clear the top deck of a bus such is the depth of apathy with which this country is weighing a major constitutional change. I hesitate to say “reform” because I think a ‘Yes’ vote would be a mistake. 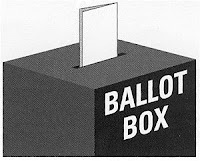 AV – in which voters have to rank election candidates in order of preference with the second choices etc of the one with the least votes being reallocated until a winner emerges with more 50 per cent – is a poor relation of proportional representation. PR sees the distribution of seats determined in the ratio of the total number of votes cast – in other words a gift to the LibDems and the extreme right. AV is just what LibDem leader Nick Clegg called it - "a miserable little compromise" - but that was before the General Election and the formation of the Coalition with the Tories. Clegg’s changed his tune – like he did on university tuition fees – because he sees it as a milestone on the route to PR. Tory leader David Cameron was obliged to offer him the AV referendum as part of the price to create the Coalition. Gordon Brown started the whole thing rolling when Labour was still in office. His successor Ed Miliband has continued to support the cause, because he like Brown wants to cosy up to the left-wing of the LibDems – and there might be a few extra seats. A third of MPs already get more than 50 per cent of votes in elections; under AV supporters of minorities get theirs counted multiple times; and coalition governments would become the norm not the exception. The talk by the ‘Yes’ campaign that their system commands the high moral ground can’t disguise that dividing lines are being drawn if not along party lines then centre-ist ones. It’s not so much that I’m enamoured with the current first-past-the-post system but rather I don’t think we should abandon a tried and trusted, relatively cheap, and certainly simple way to choose our MPs for one used by just three countries in the world – Australia, Papua New Guinea, and Fiji. I shall listen to the arguments of both camps in the weeks ahead. As of now I’m voting ‘No’; if I change my mind you’ll be the first to know. OK.GC, but AV might pave the way for PR [proper], with more political parties, and so representing a greater cross section of the British electorate. Think carefully about whose interests the present monied and priviliged cabinet really represents. They are not "all in it together", because they will emerge unscathed from their own severe policies. [Jaffa]. Read Zac Goldsmith "Why AV is not the answer".